Found in FNA Volume 8. Treatment on page 306. Plants annual (rarely perennial). Stems ascending or erect, 0.6–5 dm. Leaves usually opposite, sometimes whorled distally; blade ovate to elliptic or lanceolate, 5–30 × 4–10 mm. Pedicels recurved in fruit, 3–35 mm, longer than subtending leaf. Flowers: sepals 5, calyx divided nearly to base, 3.5–5 mm, ± equaling corolla, margins entire or minutely crenulate, broadly scarious, apex acute to acuminate; petals 5, corolla salmon, red, or blue, salverform (almost rotate), (2–)3–7(–10) mm. Capsules 4–6 mm. Seeds 12–45. 2n = 40. Introduced; Greenland, B.C., N.B., N.S., Ont., Que., Ala., Ariz., Ark., Calif., Colo., Conn., Del., D.C., Fla., Ga., Idaho, Ill., Ind., Iowa, Kans., Ky., La., Maine, Md., Mass., Mich., Miss., Mo., Mont., Nebr., Nev., N.H., N.J., N.Mex., N.Y., N.C., Ohio, Okla., Oreg., Pa., R.I., S.C., Tenn., Tex., Utah, Vt., Va., Wash., W.Va., Wis., Eurasia, nearly cosmopolitan, introduced also in Mexico. Canadian populations of Anagallis arvensis are primarily found in southern coastal regions and the lower Great Lakes. The species has been reported also from Alberta, Newfoundland, Prince Edward Island, Saint Pierre and Miquelon, Saskatchewan, and Minnesota; it is not established in those areas. The flowers close on cloudy days and as evening approaches, hence the name weatherglass. P. E. Gibbs and S. Talavera (2001) found that Anagallis arvensis self-pollinates as the petals close. This is the most variable species of Anagallis, with reddish flowers once thought to be common in more northerly latitudes and blue flowers in southern areas. There are numerous intermediate color forms. The blue form has been the source of confusion in the nomenclature of this taxon. Linnaeus described the blue form of A. arvensis as A. caerulea. Schreber used A. coerulea (note the spelling) as did Lamarck for a related taxon that is now included within A. foemina Miller. 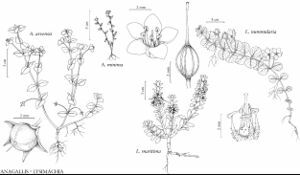 Subsequent authors submerged A. caerulea/coerulea into A. arvensis as a forma, variety, or subspecies, incorrectly crediting either Schreber or Lamarck. L. F. Ferguson (1972) distinguished A. foemina Miller (including Schreber’s A. coerulea), which consistently produces blue flowers, as a separate entity differing, in part, by petals having few to no marginal hairs, which, when present, have elongate terminal cells (in A. arvensis the petal margins have numerous gland-tipped, globose hairs), and by having flowering pedicels equaling or shorter than the subtending leaf. This page was last edited on 25 April 2019, at 18:45.